The diet is still on, don’t worry, but some times you have to have a bit of a cheat meal. Lately in Cork, everywhere you look there have been springing up “Asian Street Food” restaurants and takeaways. As someone who quite likes her food asian but isn’t a fan of MSG, seeing that the two combined in one of these establishments was definitely a call for me to try it out. 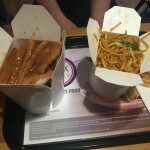 I apologise for the pictures; food blogger I am not, but having tried it for dinner one date night, I decided to try it for lunch with a friend the other day and review it on the blog. Box Noodle is on Cook St, Cork, between Patrick St and Oliver Plunkett St, so pretty central. We went for lunch at about 2pm, so after the general rush time, and the place was about half full. The previous time I’d been in there was around 10.30pm, and it was pretty quiet – this was something we hoped was not attributed to the standard of the food, but rather to its newness in the area. As I said, the market for this kind of food place in Cork is somewhat over saturated at the moment. 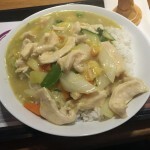 On the sign outside, we saw that the special of the day was Thai Green Curry with chicken – I was drooling just thinking about it. Being the special, the price was reduced from the usual €10.50 to €7.50, which included a drink (I had a Diet Coke) and a whipped ice-cream for after – a rather lovely touch. 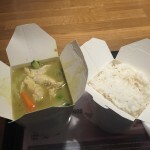 I ordered the Thai Green curry and my lunch date, the lovely Méadhbh, ordered the Chicken Katsu Curry with Noodles and green tea. This is what I’d had the previous time I was there so knew she was in for a treat! We weren’t waiting very long for our orders to come out (but not so quick as to wonder how long the food had been there!). 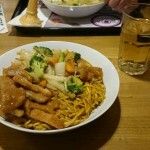 When they did we were taken aback by the portion sizes – the main takes up an entire noodle box, with another given to the side. They’re served up in these takeaway containers, you can opt to put them in the bowls which are on each table. It’s a nice touch which makes a lot of sense when you see how massive the portions are – it is very likely you will want to box up the leftovers for later! My curry was absolutely delicious – definitely on the spicier side of how I like it, I’m an absolute wuss when it comes to spicy things, but delicious and definitely filling. I wasn’t able to finish the massive portion and was full for the entire evening after – not bad for a very reasonably priced lunch! There was a nice selection of vegetables in there, not too full of onions which a lot of the Asian Street Food places seem to do, a nice blend overall between sauce, meat and veg with the rice to cool things down. Méadhbh liked her curry, apart from the lack of very much broccoli (only three small pieces; not proportionate to the rest of veg advertised) and found the chicken a little chewy, but too could not finish the massive portion. That is not to say our dessert stomachs did not come out to play. Once we’d decided enough was enough, it was time for our ice-cream. 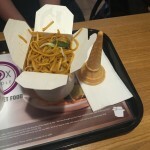 Box Noodle have a whipped ice-cream machine where each customer pulls their own ice-cream – more tricky than it looks. After some celebrations about not putting ice-cream absolutely everywhere, we paid and left, eating our ice creams and walking in the sun. It was like proper Summer. As a lunch option, both of our courses together cost 18 euros – for such massive portions and including a drink and an icecream, this is extremely good value. 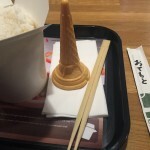 The place is clean, welcoming and the service is polite and interested – hopefully this is something which keeps up as I will definitely be back to sample some more of their delicious menu. A definite recommend for anyone in Cork for the day or night. I was not asked by Box Noodle to give a review of my meal, this was not the intention of eating there, and I paid for my own food. However I really liked the place so might as well give them a shout out! Absolutely – the difference is amazing! Bargain makes it taste better 😉 thanks for reading and commenting!